He had taken the Junior Division of the Top Gun Challenge, so this 11 year old was no stranger to accurate shooting with a squirrel rifle. That is when he and his dad heard that I knew of a place in Louisiana where you could hunt wild hogs year around. It is a good place to get your youth hunter started on hunting. I went along to put a hog in the freezer and see how the boy did. Although he had done his competitive shooting with a CZ-452 in 22 long rifle, their other rifle was a Marlin 25, in 22 magnum, which was identical to my Marlin 22 Mag. The boy was an incredible shot with the CZ and the Marlin, but I recommended a 30-30 or a 44 magnum for his first hog hunt. Well, it didn't happen that way. The kid brought along the 22 magnum and the guide let him use it after a class on the kill shot on a hog. We were looking for an 80 to 100 pound meat hog so the 22 mag would be OK. I cased up my Marlin 444 just in case of a tie, which I found can happen quickly on hog hunting preserves in Louisiana. Sissy Hall, probably the most famous female Louisiana hog hunter was our guide and told us there was one big red bad hog in the area about 300 pounds. She then took a hankering to my 444 and took it away from me, leaving me with the CZ-75 40 cal for anti-hog medicine. Sure enough the first hog we saw was the big red one. The kid took an off hand position and drilled him right at the base of the ear with a Winchester 40 grain hollow point. That hog dropped right there as Sissy gave me back the 444, “Guess we won't need this after all.” Later upon inspection I found the bullet had gone completely through the hogs head and was just under the hide on the opposite side. When the squirrel season opens in Louisiana, to me it is the hog season as well, as wild hogs can be taken incidental to small game hunts using a rimfire. So this year while doing the hog/squirrel hunt I took along my trusty Marlin 25 in 22 magnum. I used the full metal jacket (FMJ) ammo for squirrels and the hollow points for hogs, however on the hogs it doesn't matter much. Winchester seems to have the best ammo for this kind of hunting and the most accurate for the accuracy nut that I am. The first squirrel was directly above me looking down and caught a FMJ under the chin. No more meat damage than a 22 long rifle if you know what you are doing. It would seem no hogs were going to show up mainly due to an intensive drought this year that really messed up big game hunting. I was watching another squirrel when I felt something rub against my foot. I lowered my gaze and saw a copperhead, not by my foot but under it well within striking distance. Normally I don't shoot them but not this time, too close, I lowered the Marlin and using the iron sights underneath the scope, shot his head off. I took the photo right after the shot, the snake was still under my foot. Over the years I find myself hunting with the 22 magnum and less with the 22 long rifle due to the hog factor. I would like to have a semi-auto 22 mag but it seems there are problems with the development of such rifles, although CZ had a good one at one time. I once had a Winchester 94/22 magnum that was really a fine little rifle but have it no longer. The Marlin has served well and has never jammed, but to give a faster repeat shot I am thinking of going to a Henry lever action 22 magnum as I really like the handling of these rifles. As far as ammo, the old style Winchester mentioned serves me well while CCI has shown to be just as accurate. 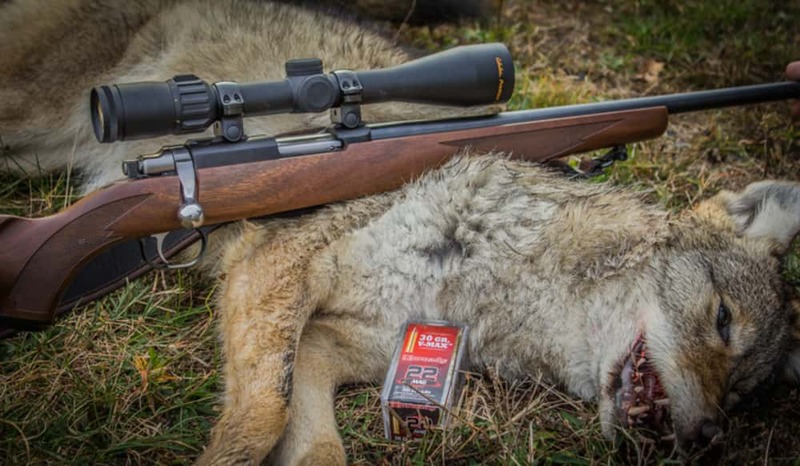 Other companies make good rounds, but are more explosive for light varmint hunting rather than edible small game, and it doesn't fall within my spectrum of usage. This includes the 17 rimfires which I like to shoot but have no hunting use for in my area. 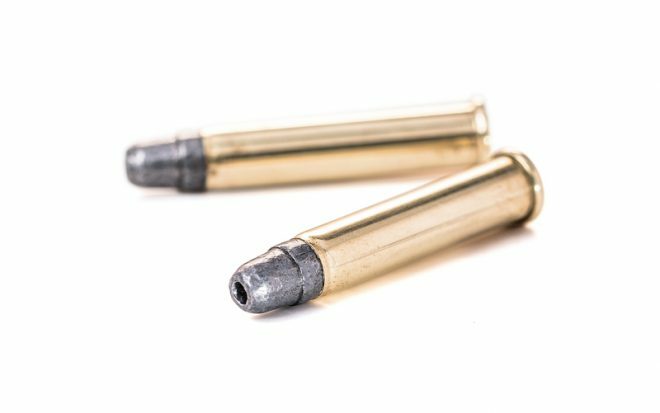 How far can you shoot a 22 magnum on game? I once got a fox squirrel at 150 yards with my Winchester, more luck than anything else. I never shoot hogs beyond 50 yards as it would lose too much power. If you can see jackrabbits at 200 yards this would be the limit I think. I once did a 180 yard shot with a 22 long rifle so the 22 magnum should not be a problem. I sight in for 25 yards as this is where most squirrels are taken and shots at 50 yards are not a problem. I like Bushnell Banner scopes for the 22s and the 22 magnum is no exception. They seem to last forever and can take extensive 22 practice and still hold zero. If I get the Henry it will have the Cabelas scope for rimfires with a dot reticle. The 22 magnum is a rifle that will fit into just about anyone's gun collection as it has many uses, being indeed a very interesting firearm...Pass it on.